NEW YORK—The city’s waste problem is only growing, and needs to be addressed on a legislative and citywide level, according to retiring Department of Sanitation Commissioner John Doherty. All of the department’s operations are a matter of budget, he noted, adding that it was apt that his last meeting with council was to discuss the preliminary budget. 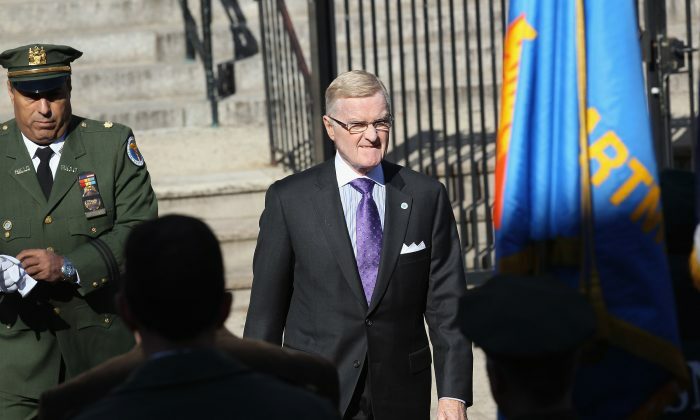 “One guy can’t say you’re spending too much on a transfer station and at the same time we [DSNY] need more workers,” Doherty said in good humor. He noted the department has made progress on the council-mandated solid waste management program, which requires the department to build new waste-transfer stations. The plan involving a contentious waste station in the Upper East Side was established under former Mayor Michael Bloomberg. Doherty, who started with the department in 1960 as a street sweeper and served the last 16 years as commissioner, fielded questions in great detail at the preliminary budget hearing Wednesday. Council members pushed him on the topic of adding more personnel in areas like snow cleanup and trash pickup, and Doherty offered alternatives like dual-sided bins to facilitate easier pickup, and emergency contract snow workers to be on standby during the winter. The city is working on the reopening of a 91st Street waste-transfer station, and building two in Brooklyn and one in Queens in order to have each borough take care of its own waste. The Manhattan location has drawn much ire from politicians and the community of the Upper East Side, who commissioned an environmental research firm to study the impacts. The report found that these stations actually increase what the city is paying to take care of its trash—from $90 per ton to $238 per ton, Upper Manhattan Council member Ben Kallos said. Yes, it will be more expensive, and the department is following the plan City Council had mandated, Doherty said. “It’s expensive, no doubt about it,” Doherty said. There are older, less efficient stations that the city is able to get rid of, but the larger problem is that New York City, with all its green initiatives, still has a very high level of waste. San Francisco recycles nearly 80 percent of its waste, Los Angeles recycles over half, and 30 percent is what’s considered successful on average. Meanwhile, New York only recycles 15 percent of its waste, although other cities include commercial waste in their calculation, while New York City does not. Doherty explained that in most of these other cities households are seeing a bill every month for their waste pickup. This currently isn’t done in NYC, which has the largest residential pickup program of any large city in the country. “That’s an incentive that’s very difficult to do in New York where the waste disposal bill is in your taxes,” he said. It’s complicated at the city level, and also in terms of logistics for the many multifamily residential units in the city. Doherty urged the council to sit down with the department to determine how recycling incentives could be furthered. The department has already started putting out recycling bins in high pedestrian areas, like Lincoln Square last week, in order to facilitate greener habits. The city had already added over $30 million this year to a $56 million yearly budget for the expected onslaught of snow, not counting the last two snow storms. The department expects to spend $35 million–$40 million more. Slow snowplowing quickly became an issue early this year, prompting many council members to ask Doherty whether it was possible to add more sanitation workers and find something else for them to do during the other seasons. Memories of those weeks are some of the more stressful ones Doherty has had in staying on an extra winter before the mayor appointed a new commissioner, but he said he has no regrets.